Photo right: Wesley UMC estimates that one program can draw as many as 50 people. 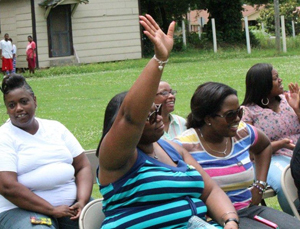 This woman had a question during the health and wellness event that the local fire department helped facilitate. Photo below right: Wesley UMCs back to school event was well attended. Children received school supplies and encouraging words from the grown-ups. Tradition at Wesley United Methodist Church in Greenwood, Mississippi, has been to provide service and goodwill to those in the congregation and the community since the church was organized in 1870. More than a century later, tradition continues through programs that promote healthy lifestyles, while poverty has a significant impact on the area. The Snowden Jones apartment community is one place where the church is an inspiration of hope. Weekly workshops there focus on the needs of children, confronting gun violence, providing education information and awareness to prevent school dropouts. Wesley's medical moments program is a monthly presentation that includes a healthy snack for the congregation. There's even a health and wellness day event that involves health screenings, food preparation and sampling. 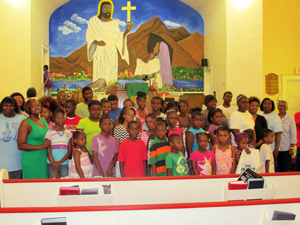 Thanks to the Mississippi Conference Connectional Ministries Mission Grants, Wesley UMC received funding in recent years to support these projects and four other youth programs that address sexual and physical abuse and spiritual growth. We give Glory to God. I would like to thank express my appreciation for all persons present and unseen for their efforts. Thank you all for your help to make receiving the grant possible and all that it helped us accomplish...We as a church will strive to make disciples of Jesus Christ for the transformation of the world. The conference Missions Grants are possible thanks to local churches paying their mission shares. In this case, Mississippi United Methodists supported keeping tradition alive at Wesley UMC. Follow The Circuit Rider for details on how to apply for the annual mission grants in the fall. The Mississippi Conference Connectional Ministries Mission Grants are matching grants available to United Methodist churches and United Methodist sponsored or related agencies in Mississippi. Grants range from $500 to $2,500 per project, with one award of up to $10,000. They are awarded to form spiritual leaders, new places for new people, connections through existing congregations and engagement in ministry with the poor; therefore, living out the four Core Values of The POWER of We.